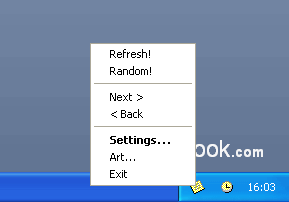 MoodBook is a tiny Windows utility that brings art to your desktop and sets a tone for your daily mood and emotions! With MoodBook your desktop looks like an art gallery changing art expositions either automatically, at regular time intervals, or manually, with a click. Each exposition has either a tranquil, neutral or vivid background and a picture of art in the center. A basic set of art delivers over 75 original digital art images of the following art styles: post-impressionism, modernism, abstractionism, surrealism and computer graphics art. Additionally, MoodBook is designed to help you control your sense and mind, set a tone for your mood, and adjust your mental state. Abstract art pictures have a major impact on your perception, as well as, the desktop background itself sets a tone for your mood, influencing deeply with the color. MoodBook is free! Hier gehts weiter zum MoodBook Download. Das Herunterladen der Software MoodBook 2.5 ist kostenlos (ausgenommen natürlich die Kosten für den Internetanschluss und die Internetnutzung). Für die Nutzung der Software gelten jedoch die Lizenzbedingungen des Herstellers/Anbieters.